I've been wanting to get a new headboard for my soon to be 5 year old sons bedroom. Right now he has a plain old wooded one that is a little to be desired. I'm wanting to remove it and add something a little more fun. I was browsing one of my favorite magazines this past weekend - Do it Yourself and thought I'd jumped online to see if they had any ideas. 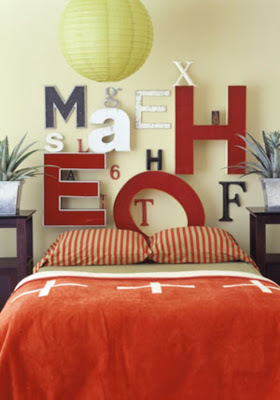 I came across this section for do it yourself headboards and saw this one. YEP this is the one and I'm going to attempt to do this with his name. How cool is this? !